Pacesetters are an elite group of top fundraisers who receive special recognition, rewards, and invitations to exclusive events, including the annual Extra Mile Brunch. Increase your impact on conquering cancer by setting your goal to Pacesetter level! Both individuals and teams can be Pacesetters. Check out our Fundraising Tips and Tools to help you along the way. Pelly is the Co-Captain of Miles and Smiles – a 2018 Four-Star Pacesetter team. Pelly herself was a Four-Star Pacesetter, and has already reached Four-Star Pacesetter this year! Pacesetters are invited to special events to network and share fundraising ideas, as well as learn more about the latest research advances and patient care happening every day at Dana-Farber. July 16, 2019 The first 100 participants to reach Star Pacesetter in 2019 are invited with a guest to Fenway Park for dinner, a speaking program, and a Red Sox game! March 10, 2019 All Pacesetters, Team Captains and Co-Captains whose teams raised $10,000 or more, volunteer site captains, sponsors, and Heroes were invited to the annual Extra Mile Brunch. Held at the Boston Marriott Copley Place, the event celebrated the success of the 2018 Jimmy Fund Walk and kicked off 2019 efforts. November 8, 2018 All 2018 Pacesetters were invited with a guest to Morton's Steakhouse for an evening of celebration with passed appetizers and a speaking program to thank them for their hard work this year. All 2019 Pacesetters will receive special gear on Walk day, including a hat and wicking T-shirt. 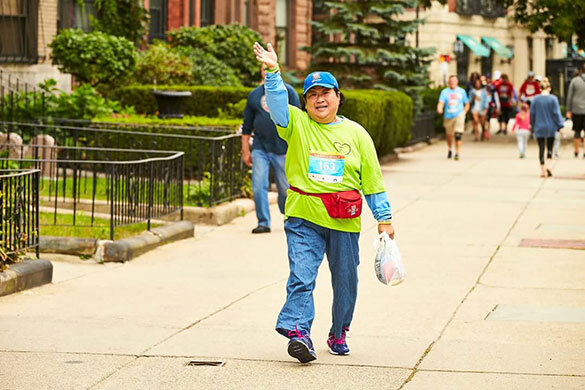 The Jimmy Fund Walk staff will be in touch throughout the year as new rewards are added, including invitations to events and more!